Spring is here and bike riding season is upon us! Since May is national bike month (#bikemonth) I want to shed some light on biking, which is a fun activity the whole family can enjoy. Taking off the training wheels can be a big step, so here are a few tips that will ease the transition to a two-wheeler. First, always make sure the child’s bike is in good condition. Inflated tires, working brakes and an oiled chain help to ensure safety. In order to properly assess if the bike is a proper height for your child, have them stand on the ground and adjust the seat so it is just under their bottom. Practicing getting on and off the bike before riding will also help them feel more independent and comfortable with the transition to a two-wheeler. A proper fitting bike helmet is a must as well! Some children may need comfortable fitting elbow and knee pads for safety. 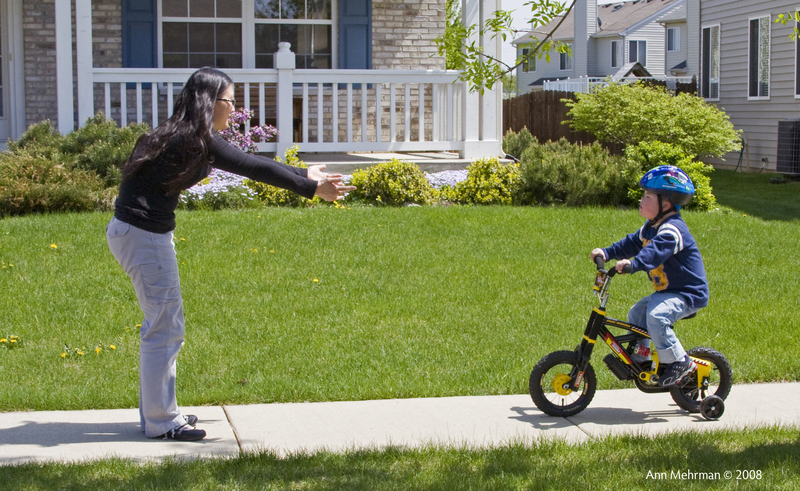 The ‘run-behind’ method, where Mom or Dad runs behind while holding underneath the bike seat to give the child peace of mind, is a proven technique for beginning the two-wheeler process. Giving positive feedback such as “keep up the good work” can keep your child from getting discouraged while learning the skill of balancing on two wheels. Offering a reward, such a family bike trip to the ice cream shop will keep your child motivated to succeed. Learning the balance of a two-wheeled bike is often the hardest part when transitioning from training wheels or a tricycle. If your child is having difficulty with the balance of a two-wheeler, it might be good to try a Strider Bike. A Strider Bike is a bike without pedals which can be used by children as young as 18 months to learn the balance, coordination and steering of a two-wheeler. This bike gives children the confidence they need to ride independently before transitioning to a bike with pedals. The best way to teach your child to bike ride and enjoy overall fitness is to lead by example. So, plan some fun family outings to a forest preserve or park trails today! Summer vacation is on its way! Many families and I discuss the difficulty in scheduling vacations. Not only do our busy schedules make it hard to go away and relax, but finding an accessible family-friendly destination can be overwhelming. But family vacations are where wonderful memories are made. I found several destinations below with a little help from a Center parent. Shared Adventures is a non-profit organization that puts on an impressive array of programs through the summer for special needs children and adults. In July, they host an annual Day on the Beach, which offers adaptive or assisted kayaking, canoe rides, scuba diving and floatation for people of all ages! Volunteers erect plywood “paths” for wheelchair access; you can also rent beach wheelchairs. The day ends with live music and free food! Splore, is a not-for-profit that provides outdoor activities for special needs children and adults at affordable prices. They organize river trips, rock climbing, hiking through a partnership with Red Cliffs Lodge. More of a resort that a hotel, Red Cliffs Lodge offers an impressive variety of accommodations and activities. There are wheelchair-accessible rooms adjacent to the lodge. Sidewalks with ramps let to all patios and to the museum. The meals are “traditional cowboy fare”, the chef can rustle up special menu plans upon request. Utah prides itself on offering accessible recreation! Island Dolphin Care is a not-for-profit magical place for children with special needs and their families to enjoy and discover new abilities through dolphin therapy. Parents and their children celebrate their strengths and even new inspirations through classroom activities and dolphin therapy. The founder, Deena Hoagland‘s goal was, and still is, to help children with special needs and their families who have developmental and/or physical disabilities, critical, chronic or terminal illnesses and emotional challenges. Deena is a mom who witnessed the remarkable recovery of her disabled son Joe, at the age of three after swimming with dolphins. Her son was born with a heart defect that required many open heart surgeries. During one surgery, Joe suffered a massive stroke which paralyzed his entire left side. Through repeated therapy sessions with dolphins and hard work, he regained use of his left side. Deena believes that all children with special challenges should be given an opportunity to enjoy life‘s experiences through a full range of activities, including dolphin assisted therapy, all children love to smile, laugh and have fun! I learned about this destination from Center parent, Lynn Matusik, whose family has now traveled twice to the island Dolphin Care. Who better to talk about their recent experience then her? Lynn: Our son Sam LOVES the water. We thought it would be a wonderful experience for him if he could somehow swim with dolphins. Due to his severe disabilities and being 100% dependent on others we were not sure if this would be something he would ever be able to do. During one of our weekly therapy visits at Easter Seals, our therapist told about a place that a fellow client had visited called Island Dolphin Care which is located in the Florida Keys. We did some research on Island Dolphin Care and found it to be a family oriented facility. Our first trip to Island Dolphin Care was in 2014. From the moment we saw his name on the board, walked out of the elevator (yes the ENTIRE facility is handicapped accessible!) and were greeting by staff, we knew this was the perfect place for our son Sam. The staff at Island Dolphin Care are incredible, welcoming, knowledgeable, patient, unbiased and understanding. Sam participated in the IDC (Island Dolphin Care) 5-day program. There are four days of classroom time and 5 days of dolphin swim time. In the classroom, families and their children are able to work toward IEP or therapy goals if they chose, with a therapist while applying those skills by participating in aquatic related crafts and projects. It was truly a time to laugh and enjoy family time in a non stressful environment! Swim therapy time with the dolphins was INCREDIBLE! Our son worked with his therapist, dolphin trainer and a dolphin or sometimes two! Sam was able to work, interact, and play safely with his dolphin in a structured environment. IDC also provides swim time with siblings so they are also able to interact with the dolphins along with their brother or sister. The last swim day at IDC is for one parent or caregiver and child. They swim freely in the water among all of the therapy dolphins and other families. The dolphins at island dolphin care are so patient, gentle and loving with the children that words cannot t express the emotions that parents feel when they see their child interact with these beautiful creatures. Seeing our son Sam smile and hearing his giggles were truly priceless. IDC is a place where parents can leave the stress of caring for a child with special needs behind and just enjoy their child. It is an exceptional experience that the entire family can participate in and enjoy! IDC will also provide you with hotel accommodation information, places to eat, other attractions, etc. to help make your stay in Key Largo one that you can enjoy with your entire family. We could tell you so much more about our trip to IDC and our son Sam but we would love for you to experience the magic first hand with your special needs child! More information can be found on their website: www.islanddolphincare.org. Tell them Sam Matusik sent you! Thanks Lynne for that great information! I can’t wait to hear about your family adventures this summer. Look for my next blog post for more family-friendly vacation ideas! As promised, here is the next installment of my favorite speech and language apps! My February blog post listed a few of my go to speech and language apps that I use during many of my therapy sessions. Here’s a few more great apps that I hope you will LOVE too! Panda Games by Dr. Panda ltd. I recently came across Dr. Panda games app and I fell in love with the adorable characters and interface! Being the therapist I am, I tried to think about how I could use these apps in my therapy sessions. Let me tell you, it was EASY! The company’s mission is to “help kids understand life and the world around them”. There are a slew of Dr. Panda apps, with one being better than the next! Each app has a different theme with countless speech, language and play benefits. Panda’s SuperMarket is my favorite of the Dr. Panda’s apps! With this app you can work on pretend play scheme for a grocery store, introduce grocery store vocabulary (e.g. shopping cart, checkout, cashier, produce section, etc. ), sequencing (First get a cart, then go shopping, checkout, and put groceries in car), following a shopping list, math/numbers during checkout, and categorizing (fruit, veggies, dairy products, bakery, etc.). If you are interested in purchasing more than 1 of these apps, checkout the “bundles” offered as they are cheaper than buying each app individually! This is an app geared towards elementary aged children who need help with conversational skills! This app is essentially a conversation simulator that works on children’s conversational reciprocity with multiple exchanges (back and forth practice). Check out the other great Mobile Education Store language apps here! You hide a photo in the bag and your game partner has to try to guess the object you hid by asking questions about it in a process of elimination type way. I have also used this without using questions, but having the child (the object hider) use different language concepts to describe what is in the bag! (the child needs to be careful not to say what the item is in the description!) I will go back and forth with the child where they are describer and I am the guesser and I am the describer and they are the guesser. Not only does this work on descriptor skills when they are describing the items, but also word finding skills when they are the guesser! You can also go a step further and make it like the game “Taboo” where you give the kids words they cannot use in their description (this is very tough). At the end of it, all the kids LOVE opening the bag and seeing what is inside! It’s a great game for using descriptor words, working on word finding skills, asking questions, and answering yes/no questions as well! If you are interested in learning about other apps and app resources, please see my February blog post here! For other speech and language ideas, please visit the Easter Seals DuPage & Fox Valley speech and language department’s pinterest page here!